To a significant degree, our counterproductive reactions to most situations involving conflict are a function of the extent to which we cling to inaccurate views of the nature of life. A primary Buddhist teaching relates to the truth of suffering and the inherent unsatisfactoriness of existence. This “unsatisfactoriness” is often manifested in the impermanence, pain and perpetual incompleteness intrinsic to all forms of life. In modern American society, most of us have lived with decades of pervasive conditioning that life should provide us with lasting “happiness.” In order to successfully promote goods, services, ideas, etc., the idea of happiness continued in these messages promises some perpetual state of bliss devoid of pain and suffering. Problems begin to surface when we come to internalize this notion of “happiness” to a point at which we unconsciously accept these messages as truth. Once this misguided idea of the nature of reality has been adopted, we are well positioned for highly charged reactions to life situations that do not square with these internalized ideals. This type of reactionary behavior and denial can be extremely unhelpful and damaging when facing legal conflict. Defensive reactions aimed at preserving egoic ideals of how life “should be” can effectively sever one from an ability to open up to a wider, more holistic view of the situation at hand. Viewing the situation from such a constrained vantage point will usually preclude identification of optimal solutions to conflict. The integration of mindfulness with law practice offers the potential of moving beyond one’s conditioning that life should not include suffering. In so doing, people involved in legal conflict may become far better able to identify and implement optimal solutions that can serve to fundamentally improve their lives long after concrete legal issues have been resolved. To learn more about the transformational potential of holistic law practice, contact Attorney Michael Lubofsky at (415) 508-6263, or visit his holistic law and mediation website at http://www.Holistic-Lawyer.com. In the current U.S. election, Donald J. Trump has campaigned on the slogan “Make America Great Again.” The policies espoused by Mr. Trump as a roadmap to this “greatness” largely pit one faction against another, implying that his vision of “greatness” is necessarily dependent on the exclusion of others from this vision. In addition, Mr. Trump has projected an immorality largely oblivious to the rule of law. For example, when questioned on business practices that may have allowed him to avoid the payment of personal income taxes, perhaps for decades, he blames loopholes in the system, as if the system should be a dictator and enforcer of morality. Stepping back from the candidates, however, what can become apparent is the energy with which a majority of the U.S. population is rejecting Mr. Trump’s underlying message. The goal of this message appears to be to instill fear in as many people as possible as a means of garnering support for his divisive plans. When we are in fear, our world becomes small, and our vision narrow. We are triggered to acquire and even hoard what we can, even at the expense of others. But we are on the cusp of a new consciousness that recognizes the importance of letting go of fear as a necessary precursor to building a sustainable, healthy society. As a result of heightened mindfulness, increasing numbers of people are becoming experientially attuned to the reality that fear-driven behavior usually precipitates a downward spiral that destroys relationships, societies, and even life itself. This fear-driven dynamic is also perpetuated by adversarial litigation. When enmeshed in narrow fears, litigants clutch for whatever award they might realize. This myopia operates largely to the exclusion of the interests of a much more broad circle of stakeholders. Any decision made or action taken on such a basis is likely to be far less than optimal and actually harm relationships and society as a whole. Holistic law practice, by rejecting the underlying notion of divisiveness inherent in adversarial litigation, is moving in step with our heightened societal mindfulness that has fueled much of the opposition to Mr. Trump’s divisive messages. To learn more about how holistic law practice can help identify optimal solutions to conflict, please contact Holistic Lawyer Michael Lubofsky at http://www.Holistic-Lawyer.com, or by calling (415) 508-6263. The mind seems to incessantly scan the environment for problems to solve. This active intellectual engagement with our environment likely served to ensure our survival as a species over millions of years as immediate physical dangers routinely confronted us in more primitive times. The mind seeks problems to solve largely within the parameters of cause and effect. Problems arise, however, when the mind latches onto a situation over which the individual lacks causal influence. When facing such situations, one can and usually will become quickly frustrated insofar as he or she is attempting to solve a problem that is largely insoluble in an intellectual, analytical mode. At times such as this, including times of interpersonal conflict commonly present in legal disputes, a real need arises to move beyond analytical thought and towards a wisdom arising not out of intellectual analysis, but out of a felt connection with all of life in the present moment. Mindfulness exercises, often including meditation practice, cultivate and strengthen one’s ability to access this wisdom beyond analytical thought. This is why holistic law practice incorporates mindfulness exercises as a necessary component of successful conflict resolution. Insofar as parties remain locked into an analytical, thought-driven orientation to conflict, they will work – consciously or unconsciously – to reframe the issues in a way that is “intellectually manageable” and solvable largely through the exercise of personal influence. Often, this is like trying to fit a square peg in a round hole. The frustration resulting from this type of activity over a prolonged time period, in no small part, explains why tension between parties in traditional adversarial litigation tends to escalate over time. Clients with no prior experience with mindfulness practice or meditation often understand, in theory, the value of a more holistic approach to legal conflict, but wonder how to cultivate a more grounded and less thought-driven approach. Mindfulness exercises incorporated in holistic law practice often begin with guided attention to the breath, body, or other somatic experience. Within a few sessions, and with some daily practice, clients report the arising of a sense of connection to present-moment experience fundamentally different from their previously narrow thought-driven orientation toward experience. It is this constrained orientation that has left them feeling frustrated and perhaps helpless. With some sustained practiceS, clients begin to identify potential solutions to conflict that transcend their constrained self-interest. At this point optimal, transformative solutions to conflict become possible. To learn more about incorporating mindfulness in law practice, contact Holistic Lawyer and Mediator Michael Lubofsky by visiting http://www.Holistic-Lawyer.com or by calling (415) 508-6263. The issue of spousal support, especially when involving highly disparate incomes of a separating couple, is one of the most challenging areas of the divorce process. Underlying the complexity are fundamental notions of “fairness” that may significantly differ for each spouse. To successfully deal with the issue of spousal support in a way that minimizes negative drag for both parties, it is essential that spousal support be addressed with deliberation and mindfulness, ideally working together with both parties outside of the typical adversarial framework. For purposes of discussion, we will assume a scenario involving a significantly higher earning husband and a marriage exceeding twenty years with no dependent children. Husband worked throughout the marriage up to a current income level of $250,000/year. Wife has made decisions at important junctures during the marriage that the couple believed were important to child rearing as well as ensuring that household-related issues were adequately addressed given Husband’s professional commitments and is proceeding forward with minimal marketable work experience. In the typical adversarial unfolding of a divorce, the husband is initially confronted with temporary spousal support demands along with the divorce petition or response. At that point, staring at a written document in isolation, what he is likely to see will be limited to the bottom-line demand that he pay 30-40% of his salary to his soon-to-be ex-wife with no end date in sight. Suddenly, despite his hard work and sacrifices over the years, he will be taking home significantly less pay every month. From the wife’s vantage point, however, it is not difficult to understand the fear and uncertainty that she faces moving forward into the future. Now in her late 40’s, with little marketable work experience accumulated over the past two decades, she wonders how she will be able to move forward in a way that anywhere approximates the life to which she has grown accustomed. Pervasive social conditioning colors the respective outlooks of both the husband and wife in this scenario. The wife may well feel that her contributions to the community have been generally devalued by society at large, and possibly by her soon-to-be ex-husband in particular. Similarly, the husband may consider it unfair to have to give almost half his pay to his wife when she is not “gainfully employed” as this term is generally interpreted in contemporary society. This stark difference in conditioning may be just the tip of the iceberg of how differently the husband and wife approach this situation. A highly conscious, holistic and mindful approach is essential in helping each party gain a felt appreciation for the outlook of the other, including underlying conditioning that cannot be ignored. Bringing a holistic, mindful approach to the issue of spousal support requires both parties to work directly with the attorney, usually at the same time. The holistic lawyer provides each party a full opportunity to articulate his or her fears and concerns. It is only when both parties feel thoroughly understood the concrete financial terms are discussed. Additionally, once a spousal support agreement is reached, there can negotiated particular protocols to see that monthly payments are both given and received in a mindful, conscious way so as to ensure that both parties feel sufficiently appreciated and valued and have not lost sight of the underlying conditioning, fears, etc. discussed at the front end of this process. 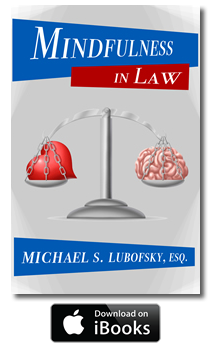 To learn more about mindful spousal support, contact Holistic Lawyer Michael Lubofsky either by calling (415) 508-6263, or by visiting http://www.Holistic-Lawyer.com. On a surface level, most disputes revolve around some discreet event in the past that an individual has come to view as having violated his or her standards of “right” or “wrong,” or some more nebulous concept of “justice.” But when the sense of violation arising from the event rises to a level at which an individual has made the deliberate choice to invoke the legal process, the likelihood is that the event, events, or situations at issue have triggered more deeply help beliefs as to how the world should operate. These more deeply held notions are likely tied to engrained learned conditioning that far preceded the situation at the center of the dispute. The problem is that this learned conditioning, and the ideas the we have held for so long about how the world “should” operate, lie beneath ordinary consciousness. These ideas are so deeply engrained that they have come to operate more habitually, usually clouding direct present-moment experience and serving as an unidentified barrier to optimal solutions to conflict. This is why the integration of meditation and mindfulness are so important to effective dispute resolution. It is only through quieting of the mind that individuals begin to more clearly identify this learned conditioning and the habitual reactions that have come to cloud their perception of, and response to, the conflict being addressed. For example, instead of indiscriminate, reactionary blaming of an adverse party for a challenging life situation, a party can come to more clearly appreciate the role of conditioning that has prompted his or her reactions, and thus come to lessen his or her adversarial posture towards an “opposing” party. The softening of this posture is essential in fostering an open environment in which all parties feel a necessary degree of safety in articulating his or her emotional linkage to the dispute, and a willingness to accept an appropriate degree of responsibility not only for the arising of the situation, but for its resolution. For these reasons, the integration of meditation and mindfulness in law practice, mediation, and other approaches to dispute resolution is at the foundation of holistic law practice. To learn more about the integration of mindfulness and law practice, contact Holistic Lawyer Mike Lubofsky by calling (415) 508-6263, or by visiting http://www.Holistic-Lawyer.com. In working with clients to break through learned conditioning and habitual reactions that have led to, or exacerbated, legal disputes, holistic law strives to tap into the inner wisdom of participants as the primary source of optimal solutions. In orienting the identification of solutions towards clients, holistic law presents a fundamental challenge to the entrenched paradigm in which clients primarily look to the attorney for answers and solutions. In addition to the client-centric solution focus, holistic law practice presents a serious challenge to the livelihood of many attorneys who have made their living as advocates within an adversarial system. Given this direct challenge, it should be expected that the holistic law movement will be met with formidable resistance from the predominant legal establishment. For the first time, however, there is an emerging segment of the public that has engaged in mindfulness training and practice, and has come to experience and appreciate their inner wisdom apart from their learned conditioning. Thus, conditions now exist for a shift away from the adversarial model, and towards a more client-centric or holistic model of law practice. In the context of civil dispute resolution, statutes, common law, and procedural rules are predicated on a dualistic notion of “justice.” By this is meant that the entire system is built largely on the premise that one party is “right” and the other is “wrong.” It assumes that through vigorous advancements of divergent positions, “truth” will ultimately emerge enabling the trier of fact to fit this version of past events within laws and rules that legislators and courts have deemed minimally necessary for the successful functioning of society. In recent decades, however, a far more expansive notion of “truth” has begun to permeate American culture. This notion is largely based on a felt appreciation that we are not islands unto ourselves; that everything we do has impact on others in our lives, social institutions, the physical environment, etc. When “truth” is considered in this more expansive fashion, one begins to appreciate how limiting the truth within our current adversarial model clearly misses the mark. Disputes “resolved” based upon this fallacious premise and narrow concepts of “right” and “wrong” may provide some fleeting sense of victory to one or more litigants, but most often does little to successfully address the multitude of competing interests that usually come to bear on any civil dispute. When this notion of interconnectedness becomes the foundational premise of our dispute resolution model, we will have moved beyond our current adversarial system and toward the resolution of disputes in a way offering far more optimal and sustainable solutions. To learn more about holistic mediation, contact Holistic Lawyer and Mediator Michael Lubofsky at (415) 508-6263, or visit http://www.holistic-lawyer.com. Like most people who find their way to mindfulness practice, I did so many years ago in efforts to find more sustainable solutions to dealing with stress as a driven, young attorney in my late twenties. In what was an early incarnation of what is now called mindfulness-based stress reduction, or MBSR, I did find that by becoming more mindful of my breath, I could slow down my heart rate. The ability to do this seemed to give me a sense of relief that, up until that time, I may have thought would have only been available from solutions existing outside of myself in the form of food, drink, other people, etc. I had no awareness or knowledge at that time of any sort of template for living in a way that could potentially transform that sense of relief into deep, sustainable inner peace. Even if such a template had been presented to me at that time, I would have thought it to be so contrary to my priorities that it would have been quickly dismissed. For years, actually decades, I continued to practice meditation almost solely for the physiological relief it afforded me from the typical stressors of contemporary American life. For a good deal of this time, however, I pretty much continued thinking and acting consistent with conditioning I had internalized through my formative years. This conditioning, I can now appreciate in retrospect, had forged a strong egoic identity that was largely impermeable to the notion that I might look upon life in fundamentally different ways. But as will often happen as we get older, life has ways of humbling just about everyone. Over time, we amass wisdom of experience that may, at some point, serve to penetrate the ego and open us to new ways of thinking and being in the world. Once this door is opened, we can begin trying new ways of orienting towards life experience. We can begin to let go of maladaptive strategies and behaviors. We can walk out into life with an open sense of wonder and begin to experiment with new ways of being that would have previously been too threatening to the ego. At this point, through trial and error, as well as with the benefit of wisdom from others who have walked this path over millennia, we can come to identify specific ways of being and acting in the world that actually deepen our inner peace for beyond stress relief. What is most amazing, though, is finding that those ways of being and behaving that most foster inner peace are actually those ways of being and behaving that help others, make the world more compassionate, promote health and well-being, reduce waste, promote sustainability, constructively resolve conflict, etc. Even as an experienced practitioner, however, I encounter times when my conditioning, together with societal norms, cause me to question the purpose or value of sustaining a spiritual practice beyond “stress reduction.” After all, much of what is required is contrary to behaviors that are “valued” in contemporary American society. The answer to this question, though, I have come to view as the ultimate win/win scenario. What I have found is that the behaviors and ways of being in the world that help others and actually treat the world in a far more sustainable way are actually the behaviors that provide me with inner peace and clarity. When venturing out into the world with this foundation, life becomes far more interesting as behavior is not driven and limited by egoic notions of how life “should” be. To learn more about the benefits of mindfulness practice, especially as applied to legal disputes and conflict resolution, please contact Holistic Lawyer Michael Lubofsky at (415) 508-6263, or visit http://www.Holistic-Lawyer.com. An increasing number of studies point towards the integral role that compassion and empathy for others plays in cultivating happiness and well-being. Compassion arises from a felt connection to all of life in the present moment. Compassion lies beyond thoughts and preconceived notions about a person or a given situation. The typical adversarial approach to conflict resolution that pervades contemporary civil justice in America is rarely effective in cultivating compassion and/or empathy. Instead, one’s thought-driven notions of how things should be most often form the basis of an attorney’s litigation strategy. Such a failure to elicit compassion and empathy can explain why, far more often than not, legal or “courtroom” victories ring hollow for a prevailing party soon after a fleeting sense of ego gratification dissipates. In contrast to this prevailing adversarial model, holistic law practice has as a primary objective the cultivation of compassion and empathy prior to the development and implementation of a concrete legal strategy. A fundamental precept inherent in the holistic approach is that optimal, lasting solutions to interpersonal conflict arise from beyond ego, thought, and preconceived notions. To learn more about holistic law practice, contact Holistic LawyerMichael Lubofsky at (4-5) 508-6263, or visit http://www.mindfulaw.com.